One thing that I have learned since starting our natural living journey is that everyday household items are used a lot. Every time I get in the shower I see things that use to be only in my kitchen on my shelves. One of my go to beauty products that does double duty is coconut oil. I use it more often in my bathroom then I do in my kitchen. That may sound odd but let me share 5 of my favorite uses for coconut oil [other then cooking] and maybe you’ll add a jar to your bathroom as well! First, there are two types of coconut oil – refined and unrefined. Unrefined coconut oil smells like coconut! Oh happy day! Refined does not as it has been processed. I use coconut oil probably once or twice a week because a little goes a long way. Here are the 5 ways that I use coconut oil during the week. 1. 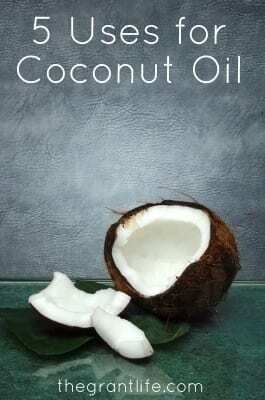 Hair mask – Amanda from a Royal Daughter told me that she used coconut oil on her [beautiful] curly hair and I was intrigued. Im always willing to try anything that will help tame my hair beast. As I started to use it once or twice a week, I noticed that it also helped my psoriasis on my scalp. After a few months I was even able to stop using my medicine for my scalp because it removed mostly all of it! Plus, it moisturizes my hair and leaves it super soft after. When I use it I start with the coconut oil and then use shampoo to wash it out. [And it still leaves my hair soft after.] The coconut oil can be well, oily, so I want to make sure my hair doesn’t look greasy after. The coconut oil then shampoo method works best for that. To use as a hair mask – scoop out some coconut oil and apply it to your roots and scalp while in the shower. Twist it into a bun and let it sit for about 5 minutes. Rinse out then apply your shampoo. A few words of caution: coconut oil will leave your tub slippery after so be sure the person after you knows that. I step out of the shower and turn the water really hot so that it will help get rid of the oil on the tub floor. 2. Shaving cream – I ditched regular shaving cream years ago mainly because it was expensive and I seemed to go through it quickly. [Two things I don’t really like.] Instead I use my handy dandy [earth friendly] coconut oil. Its super easy and it leaves my legs feeling so soft! Just apply it to your legs and shave as you would normally. 3. Cuticle cream – This one is something that is a great effort of using it regularly in the shower. It moisturizers my whole hands but my cuticles get the main benefit since I use my finger tips to apply it to my scalp and legs. 4. Lip balm – Apply it to your lips while you are in the shower for an amazing all day lip balm. You can add a little sugar to some coconut oil and make a lip scrub. Check out this recipe for a DIY whipped lip scrub! Its fabulous! 5. Moisturizer – Im sure its clear that coconut oil is a great moisturizer. I use it on my elbows, my knees and any other dry part of my body while in the shower. I let it sit on the dry spot for a few minutes and rinse it off. Here is a super easy homemade whipped body butter. All you need is two ingredients! One last tip about using coconut oil – buy the cheapest one possible. Coconut oil by nature is an organic product, so when you see an extra ultra super organic version, it probably comes with a extra ultra super organic price tag. I buy the LuAnna brand and it works great. We are heading home from Michigan today so I will be adding videos to my natural living series once we are settled back home. Also, if you want to see what the other moms are up to, follow the #30daymom hashtag. Ill be back tomorrow with another natural living idea from our family to yours! Be sure to grab your free natural products e-book as well. In it I share 7 “recipes” for natural products that use coconut oil. It’s great to have on your phone or tablet. Awesome tips! I really love the idea of using it for my legs. 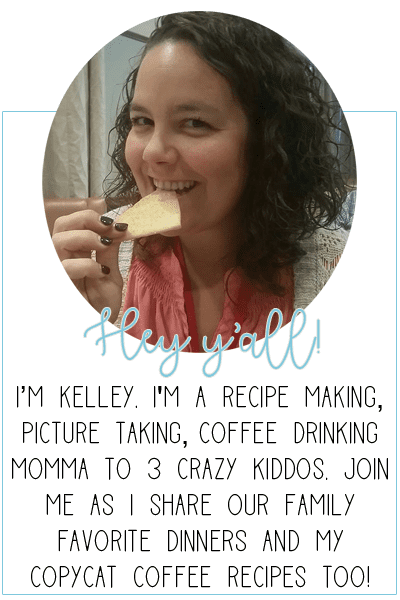 Kelley, I have a question about the coconut oil–if you use it to help the psoriasis on your scalp do you think it will help with cradle cap that is hanging on into toddlerhood for one of my twins? I’ve never used coconut oil, so I was just wanting your input…thanks. Yes! It would be great for cradle cap! I use it on my kiddos for the exact same thing! Love these tips! I already do the hair mask. I want to try using it has a night time moisturizer for my face next. Pinning! Thanks Katrina! Isn’t the hair mask great?? Let me know how the face moisturizer goes! It also works great for excema. I will have to try it on my hair. FYI: If you buy unrefined coconut oil, you will get the wonderful coconut smell. Refined coconut oil, like the LouAnna takes the smell out. Ohh! Well thats good to know! I hadn’t read that before. Thanks Angie! I just bought some coconut oil for the first time and have yet to use it. The possibilities are endless! I love your idea of making a lip scrub – I’ve been trying to find an old tube of it I have, but now you’ve inspired me to make my own! Thanks so much Kristin! Here is a recipe for a lip scrub that I made this past week – http://thegrantlife.com/whipped-lip-scrub/ It was really easy and worked so well! awesome ideas!!!! Def going to test it on my husbands hair first and I’m so glad it can be used as chapstick… I now have an endless supply of it.. So how do you use it for cooking? Thanks Aimee! It great for your hair.. and lips! I use it in place of regular oils when cooking. I use it to wash my face. Mix in about a tbs of sugar into about a third cup of oil and it scubs and moisturizes. I haven’t had to buy face cream in so long, saves me a lot of money. Thats a great use! I need to try that asap! Do you whip the coconut oil you use for shaving? Because I’ve tried it as is and it did not work out for me in the past. You can whip it – but I normally just slather it on right from the container.